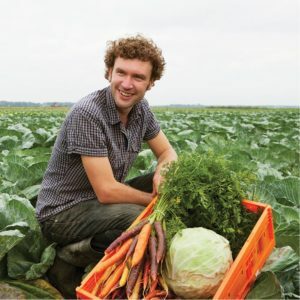 BioRomeo started as a producer of Organic and Demeter certified vegetables and crops, but grew to being a supplier of a complete range of products through collaboration with like-minded farmers. We grow potatoes, carrots, mixcarrots, beets, sweet potatoes and parsnips on our own soil. Through cooperation with farmers from the area, we can expand the range with various types of cabbage and burdock root. In addition, there is a large selection of organic summer vegetables, lettuce, pak choy, cucumber, tomatoes, spinach… too long a list. Bioromeo offers various packaging units, we can sort and wash the products and, if desired, we also arrange transport. Ordering is easy via email! Our products are EU BIO certified, GLOBALGAP certified and Demeter certified. The seasonal calendar below gives an impression of the products that we have available.